Who has a bear-fighting love interest, a crossdressing sister, a father addicted to gambling, a trio of near-identical suitors, a major case of indecision, and some seriously fancy fur coats? Arabella does. The titular character of the Richard Strauss’ opera (libretto by Hugo von Hofmannsthal) must fumble her way through some pretty major cases of miscommunication, misunderstanding, and misidentification to attempt to find her true love — and, ideally, drag her family up out of poverty along with her. 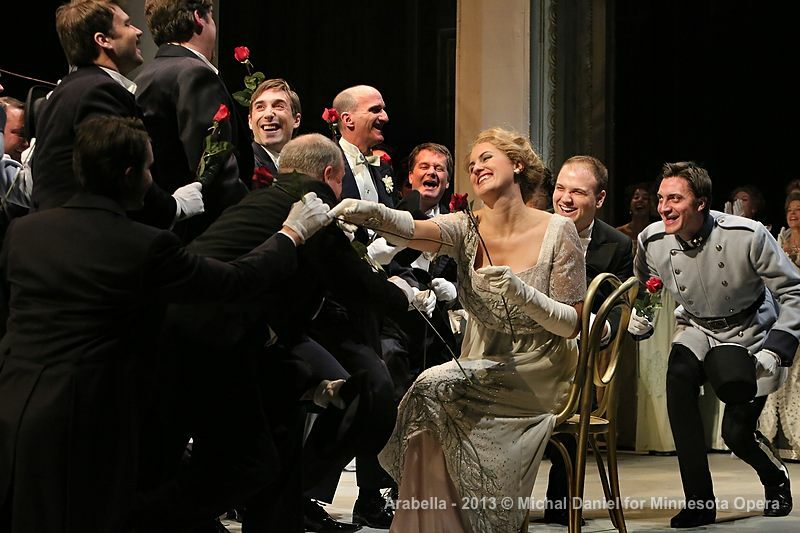 Jacquelyn Wagner as Arabella. Photo by Michal Daniel. Arabella is set in Vienna in the 1860s, and in some ways it feels as far away from 21st-century Minnesota as it is, and at other times it feels surprisingly relevant. Never mind the set and costumes; people do not rely on hand-delivered letters much anymore; nor do they (generally) have to pay dowries on their daughters or “sell” their daughters to the highest bidder. Dressing your youngest daughter up as a son to avoid the costs of introducing her into high society sounds ludicrous and illogical to me, but it made sense to Count Waldner, the patriarch of the family at the center of the opera. All that said, there are some parts of the opera that are, if not timeless, at least ring true in 2013: secret gambling addictions, spending more than is in the bank, people torn between what is pragmatic and what their hearts desire, not to mention the vicious power of gossip, the pain of unrequited love, and the temptation to do absolutely ridiculous things in the name of a crush. The Minnesota Opera’s production is solid. Music director Michael Christie does an excellent job, and although your attention may tend to focus on reading the captions (unless you speak German) and following the action on stage, and by the very nature of opera, the musical emphasis tends to fall on the singing, Strauss’ score is absolutely bewitching. Jacquelyn Wagner leads a strong cast as the eponymous Arabella — even an opera dummy like me can hear how beautiful and clear the soprano’s voice is — and she plays the part so well that I would struggle to believe that in real life she isn’t an idealistic but impoverished young Austrian woman, used to ball gowns, sleigh rides, and declarations of love from rich suitors. Her love interest, the Croatian Mandryka is solidly portrayed by Craig Irvin, who pulls off the tough-on-the-outside, romantic-on-the-inside character well. His emotional outbursts and the way he moves around the stage fluidly, expansive gestures and table-jumping make his character pop out, distinct from Arabella’s other cookie-cutter suitors. On the other hand, Elizabeth Futral‘s performance as Zdenka, Arabella’s younger sister who is required to dress in drag for financial reasons, seemed jerky and awkward. If this was part of her character’s personality, it was not clear — particularly being physically smaller than most of the rest of the cast, and frequently draped in clothes that dwarf her frame. But her singing, particularly during Zdenka’s duet with her sister in the first act. Craig Irvin as Mandryka, Elizabeth Futral as Zdenka, and Brian Jagde as Matteo. Photo by Michal Daniel. 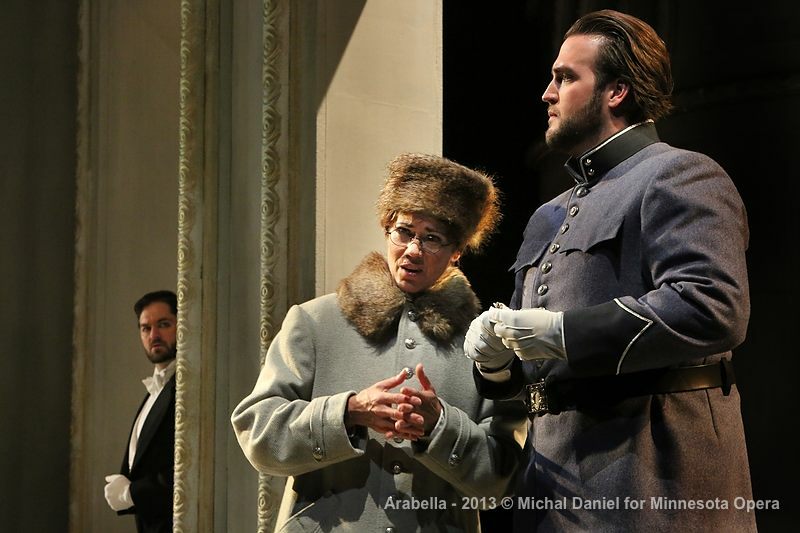 Arabella is certainly not the most dramatic or exciting opera out there. It delivers some laughs, and gives the audience pause to think here and there, but it’s not the most hilarious of comedies, and doesn’t have the weight of a tragedy. I found this fact perhaps aided by Tobias Hoheisel‘s set and costumes, which are lovely and artful, but lack much colour; with few exceptions, the production is full of whites, greys, and the palest hints of colours. This may be representative of Vienna in the 1860s, or may be to showcase the story, and maybe this is my perspective as a millennial used to bright colours and fast-paced action, but I found it a little drab, and less visually interesting than it could have been. Still, with Arabella, the Minnesota Opera presents another strong production in its 2013-2014 season, and I applaud the program for its ongoing efforts to reach out to younger audiences and to make opera more accessible (their website includes a podcast, “Opera in 60 Seconds” videos explaining each production’s plot, and information about their young professionals club Tempo, among other things).